During this CELL, students examine the relationship between cellular organization and tissue function. Students learn that cells within a tissue replicate to form new cells by going through the cell cycle. Along this path, they examine the stages of the cell cycle in detail and build a model to represent how a cell moves through the four phases (G1, S, G2 and M). Finally, students investigate how the cell cycle is regulated and observe that loss of regulation of the cell cycle can lead to cancer. Review cellular organization and how this organization relates to tissue function by examining slides of lung, skin, and breast tissue. Learn that cells are normally lost from some tissues during growth and development. Students are introduced to the cell cycle and investigate how the cell cycle allows for cell replication and replenishment of lost cells. Build a model of the cell cycle and examine its four phases; G1 phase, S phase, G2 phase, and the M phase. Observe slides of tissue in the M phase of the cell cycle and examine the stages of mitosis; prophase, metaphase, anaphase, and telophase. Discover how the cell cycle is regulated and why regulation of the cell cycle is important for normal tissue function. 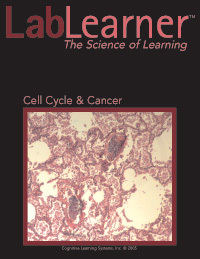 Learn that the loss of regulation of the cell cycle can lead to the development of a tumor and cancer. Compare slides of cancerous and normal tissues in order to draw conclusions about the disorganized nature of cancer cells within a tissue.